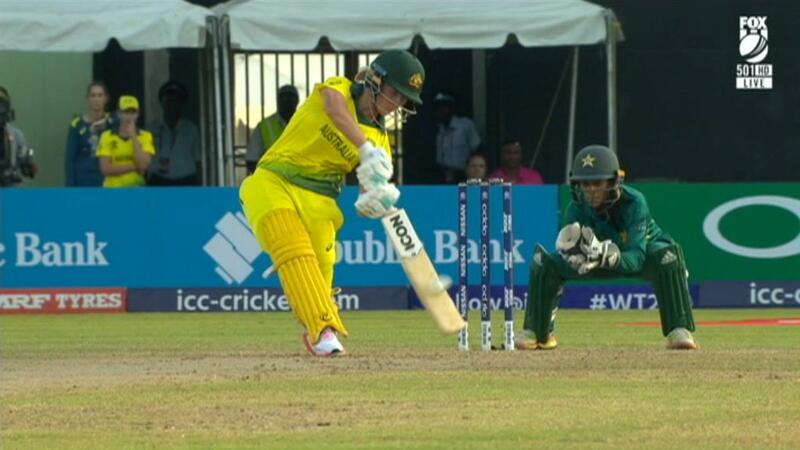 Openers Alyssa Healy and Beth Mooney helped power Australia to 5-165, before the bowlers restricted Pakistan to 8-113 in a 52-run win in their women’s World Twenty20 opener in Guyana. Pakistan was tasked with completing the biggest successful run chase in its team’s history, but fell short in its innings with Megan Schutt (2-13) and Georgia Wareham (2-18) claiming two wickets each. In Australia’s innings, after Healy and Mooney took the score to 0-58 from the opening six-over power play against the spinners, the tournament favourites slowed when both holed out for 48. Healy’s knock was particularly electric, coming off just 29 balls as she hit powerfully through the leg side and struck a massive six straight down the ground in the game’s opening over before falling to seamer Aliya Riaz at long-on. Mooney’s innings came from 39 balls after she was dropped on just 2 at cover in the fourth over before the ball eventually crossed the rope. But she went for one too many as she attempted to lift the tempo in the middle overs, also finding the fielder at long-on when she looked to take on Nashra Sandhu. Australia coach Matthew Mott opted to stick with the same team that beat Pakistan through the majority of the 3-0 sweep in Malaysia last month, overlooking offspinner Jess Jonassen, who is returning from a knee injury. The form team headed into the tournament, Australia aims to reclaim the trophy it won three times straight between 2010 and 2014 but dropped in 2016.